May 2018 new lower rates coming! Click Here-->Free shipping to points in So Cal. We offer the lowest shipping rates possible. Our friendly staff will be happy to quote you shipping costs before you order. Please do not hesitate to call, just to get a shipping cost! We are glad to help! We have our computers on line and direct to the freight companies for immediate quotes on shipments in the 48 states. For out of the country rates or drop shipments, please do not hesitate to call or email for quotes! Small items like scoops can be sent by UPS. Many of our products must be shipped by common carrier (truck). We only use the most reliable carriers. We use national carriers that are familiar with your home town or place of delivery. And "NO" residential delivery fees are added! We Ship World Wide, Please Call For Shipping Prices! When placing your order, we will look up the current freight charges. For large items....hoods, most fenders, front ends and large trunk lids they will be shipped by truck. These shipping charges will be collected upon placing the order. Freight companies travel day and night to get your shipment to you as quickly as possible. For Pricing to Europe, Asia, Mexico, So America, Japan, Africa, New Zealand, Australia and others, please do not hesitate to call or FAX. We can quote you "exact" shipping charges. These charges would paid before we ship. You would pay duties and customs fees upon arrival. Most overseas shipments go by air freight. Most items like hoods and fenders can be shipped by truck. We use some of America's largest and best carriers. Their extensive network of nationwide terminals insures the highest quality delivery service. We have negotiated a volume discount of 63% to 75% with these carriers. Your shipment will automatically have the 63% to 75% discount applied to it. We have also negotiated a "no residential delivery fee" with most carriers. In some areas of the country we have negotiated better freight rates through other reliable freight companies, and in some cases the charges reflect better discount rates. Of course rates can vary due to fuel cost fluctuations. All freight must be pre-paid when placing order. Careful packaging assures that your product arrives in perfect condition. Reinforced inserts protect all edges. Smaller items, like scoops are shipped by UPS, call for exact UPS charges. These UPS charges will added to your payment. Typical UPS charges are from $12 to $65, depending on the "size" of the part ordered. Springs, pins and small items are $10.50 to $15.00 shipping. Example: SC-108, SC-114 and other cowl induction scoops, shipping cost is approx. $25 to $65 and are shipped as "oversize". This oversize requires a 30 lb rate because of the box size, even though the "boxed" weight is about 8 lbs. This is a UPS rate condition. The cost for this shipment would be approx. $25 to $60 depending upon your location. Some items require a 70 lb rate because of the "size" condition applied by UPS. All scoops and numerous small items are in stock for immediate shipping. In some cases we will use FedEx Ground or another reliable delivery service. We regularly ship to other countries any where in the world. Please call, fax or e-mail your order and we will contact you within a day or so, with exact shipping costs. We will need your complete shipping address to process a shipping quote. All items are carefully packed in our specially designed containers. We have developed our packaging over many years. We feel we that our boxes and the special "interior" cushioning we have designed, exceeds all others in this industry. Customers I just wanted to thank you for your patience with me thank you for sending me a catalog it was very helpful and clear. I will be buying a hood and scoop in the next day or so. Your sales people are very helpful. It was really nice and huge difference than calling one of the other mail order places. I didn't have to go through 5 people to get an answer the lady I talked to knew everything I needed to know. Very pleased customer. I recommend UP22.com! hood for my 67 camaro. NICE!!! (ordered from up22.com) .....I didn't have any problems with them and I am pleased with the results. I was actually working on it earlier this evening. As soon as I get the final sanding done, then I'm taking it to get painted It really looks good! ....I have received my hood and springs in excellent condition and the items are everything I expected and more. Thank you for an excellent product. jk..OR I just got my bumpers. They are great! You folks have the highest quality fiberglass parts I have seen in 15 years of restoring and hot rodding cars. I will E-mail you some pictures when the cars are done. Thank you again. g.n. NJ I just recently purchased on of your rear bumpers for my drag car and everything's great. I recently ordered the V-209 "valance" panel from Unlimited Products. I was very impressed with the way it was shipped and the care in building. I will send photos of the restored '76 Vega with GLASS replacement parts. You guys are the BOSS. Don't stop what you do. d.p. TX My full front end for '55 Chev arrived today. I was very happy with quality and fit. 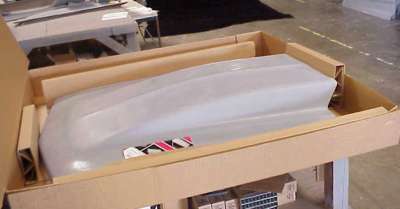 I showed my friends and we all agreed that it was one of the best fiberglass items we had seen. My neighbor also commented on the great packaging, all was in tack. Love the hood, great packaging too! I have ordered from other companies before, this is the best hood I have ever gotten, nice work, I will be ordering again. j.r. CT Kind of like ordering a mail order bride, you might see a picture, but f'glass parts can be scary. Got my parts from your website at up22.com. Your parts are great!. I will recommend to the guys at the races. "I am very pleased with the hood (BK128T) that I bought from you. The fit is nice, the quality of material seems good and the short time it took to receive the hood from you was surprising." t.h. TN To Unlimited Products, I got the fenders for my 1955 Chevy last week. The fit was outstanding. My friends have bought from others and were not satisfied. Thank you for your outstanding work. I thought I would write and let you know how pleased I am with the SC104 hood scoop I bought from you in January. The scoop was packaged very well and arrived with problems. I was very impressed with the finish and thickness of the scoop. It gave my car the aggressive look I was hoping for, and was just the right size. I have included a picture of the car after mounting and painting the hood scoop. Thanks again, I would recommend your products to anyone looking for quality fiberglass parts. S.S. OR I am currently using your hemi bolt on scoop on my Belvedere and it has great quality! I recently Received my scoop, a R82E, that I ordered from Unlimited Products and was extremely happy with product. I placed it on the hood for a practice fit and it fit like a glove. KUDOS!!! to your manufacturing staff and their quality workmanship. I definitely recommend you to anyone that is in search of a hood scoop any other of the products that you carry. Toll Free (877) 735-7772 (7:00 to 4:30 Pacific Time) Mon-Fri.